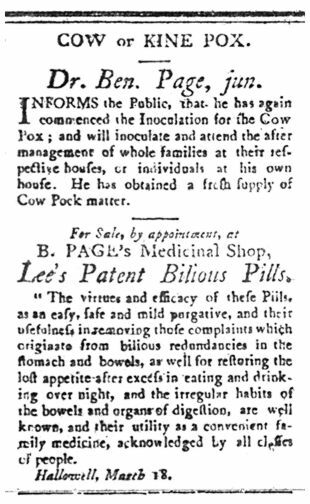 Eighteenth-century doctors prepared medicines from local and imported ingredients. In addition, some sold commercial preparations and ingredients to other doctors and to patients. Unlike today, no laws governed the sale of such drugs. 1. How could Dr. Page have obtained these items? 2. To whom might Dr. Page have sold his remedies? This advertisement appeared in The Kennebec Gazette on March 27, 1801.